The Toddlers Room caters for up to 24 children from 2 to 3 years old. The large room has a carpeted area for soft play and a hard floor area for games and creative activities. It is light and airy and has direct access to the garden. 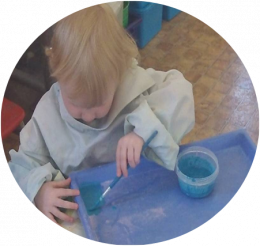 The room is welcoming and extremely well equipped with educational toys and games, it is a hive of activity, whether the children are baking biscuits, getting messy with paint or reading stories, it’s all great fun. The children eat all meals together at tables, developing their social interaction skills. Most then have a nap after lunch in our quiet area. 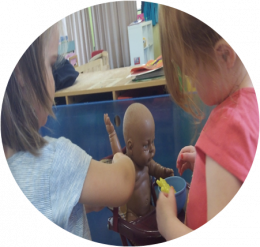 The emphasis in the Toddlers Room is learning through play and the children have a free choice of a wide range of activities. 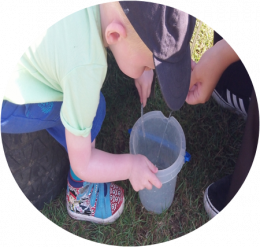 In this room children are encouraged to become more independent and thrive on interaction with their peers alongside a supporting key person.